While most of Albion’s student population high-tailed it out of here after exam week to spend some much needed time at home, a handful of us packed up our rooms and carted our belongings to Seaton Hall, where we would reside for a majority of the six-week break. As members of the Swimming and Diving team, we remained on campus over break to train, much like both the men’s and women’s basketball teams. International students stayed on campus as well, but beyond that, campus was eerily deserted. 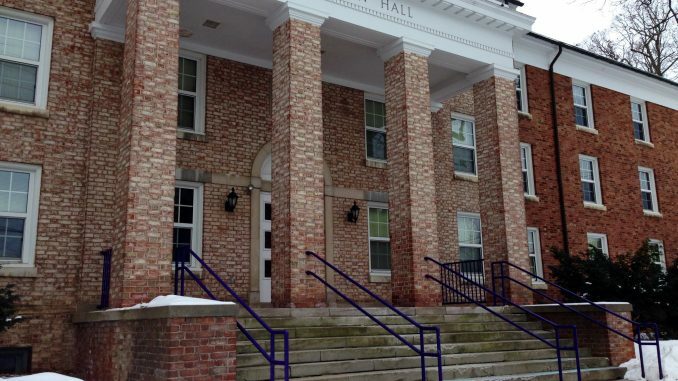 We have thrown together a list of ten things we learned by staying on campus over break. Some of these things are comical, some serious, and some are unexpected, but all of them ultimately demonstrate the same idea – that the best things about Albion’s campus are usually closely related to the people who inhabit it, and without those people, things get boring pretty quickly. 1. Sidewalks are incredibly icy without the full maintenance staff. Everyone deserves a break, especially our hardworking facilities crew, but if you went off the beaten path (pun intended) you found yourself in the icy showdown between you and gravity. 2. Baldwin workers are pretty cool people and actually have a sense of humor. There would be times where it was just the swim team and the five or so Baldwin workers hanging out. We found ourselves standing for long periods of time in front of the food just chatting away because hey, they were probably a little bored, too, and it turns out they can crack quite the joke. 3. Carl, a Campus Safety employee, has played golf with Arnold Palmer. Albion is full of fun facts like this. And since we were so desperate for human contact besides swimmers, we had long conversations with Campus Safety officers Baldwin employees. A lot of them have led some pretty interesting lives and have some great stories to tell if you get them talking. 4. Dorms are really creepy without the student population inhabiting them. The creepiest part is the silence. It is a little unsettling to walk through a residence hall that is completely quiet. 4.5. In fact, Seaton was a little bit like a prison. Even though we had our friendly neighbors the men and women’s basketball team and the international students, Seaton was hardly full and it was a scary atmosphere living in a half full dorm room. 5. If all you’re doing is practicing four hours a day, you start to miss classes more than you’d think. In fact, you find yourself wishing that you had homework, just to give you something to do. I kept desperately wanting to run into my professors and see if they needed any help. When you have been through all of Netflix’s suggestions and your Facebook feed is dull, you just want to go and do something, anything. Even homework. 6. Since there’s no one here, it’s basically a judgement-free zone. It does not matter if you wear the same clothes for five days in a row, there is no one here to impress, and no one here to call you out on it. Sweatshirts and leggings for days. No further explanation needed. 7. While living in Seaton, you’d do anything to break into your own dorm/house/frat and just hang out with your roommates (see 4 & 4.5). Since you are moving all your belongings into a Seaton room for only a few weeks, it never quite feels like home. You start missing really strange things like your toothbrush holder and even that really ugly poster your roommate has hung up on her wall. 8. The Mary Sykes room is real. It seems that we are always hearing about this mythical place in CPO e-mails and campus announcements, but it was not until we were living in Seaton that we actually discovered that this room is not a myth, but an actuality. Granted, we are still not entirely sure who eats in the Mary Sykes room, or why it is there, but we are just excited to finally discover its location. 9. Baldwin trays still exist! The cafeteria hasn’t utilized trays since last May, and we’ve been wondering what happened to them. It turns out they are still here on campus, just packed away in some dining facilities closet, only to be used in the Mary Sykes room. 10. As much as you missed everyone, you are still alarmed and a little bit afraid when the rest of the student population starts to return. Suddenly campus was overrun with people, and as happy as we were to see them, we would be lying if we said the sudden explosion of the campus population did not give us a little bit of an anxiety attack at first.